Whilst the majority of the population bask in the warm glow of their duvets and prepare for the weekend ahead my Saturday mornings are usually starting at around 5am as I prepare to set off to the far reaches of the Sudbury countryside or beyond. This weekend was slightly different as I was scared witless when my 6 year old daughter appeared in the kitchen asking for breakfast, a full two hours before her normal early rise. After calming myself down and packing her back off to bed I was able to return to normality and prepare for the event ahead. At Taste the Cracklin, we had been deep in preparation all week for last weekend’s events. Two big parties, luckily both of them in the town itself – a pretty large wedding on the Saturday and a big company celebration on the Sunday at a beautiful country house. So once my heart had stopped thumping from the little one’s early morning scare-fest, I grabbed an extra large coffee and headed off to the hotel. With over 160 people arriving later that day I was meeting the rest of the catering staff there later whilst I fired up the main roasters for the reception in the afternoon. I had prepped a fantastic local piece of lamb and huge pig for the wedding event – whilst the catering guys were in charge of the side dishes, salads, potatoes and vegetables. 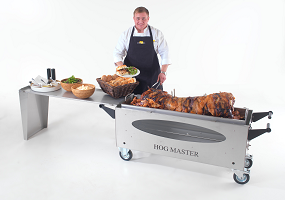 For the wedding we were doing a relatively simple roasting rather than the full on spectacle – both the roast and the spit roast give an amazing flavour but there is a difference in costs. We had a really great time at the wedding and the staff from the venue were brilliant – which makes a big difference when you have a long day. The Sunday corporate event was an even more hectic day with a one o’clock start for the hospitality, we all had to be up and running in the gardens by seven o’clock. With three of our Titan machines to get set up and around five to six hours cooking time ahead, the first hour or so of the party is always all hands on deck. With the weather proving a little tricky this summer we had brought plenty of shelter in case the heavens opened. Luck was on our side however and grey skies circled us but stayed away to give us a pretty decent day. At Taste the Cracklin we pride ourselves in our ability to cater for any size of event and I find that sometimes the bigger events can be a little daunting but this works party was a real celebration and there was a proper family atmosphere. Celebrating five years from their foundation this was a local Sudbury company that was giving itself a pretty big slap on the back and when you’ve got a hog roaster, enough food for a small village and an inflatable obstacle course and roulette wheel – everyone has fun. They even promised to hire us out for another event later in the year – I suggested they may want to hire their own machines and have go themselves. The CEO was amused at that and said he’d leave it to me and the rest of the gang. However if you are a little more adventurous then we have plenty of purchase or hire options, if you give the office a ring they can help you with any event you need. Taste the Cracklin is an option for you if you have a small party and fancy producing your own feast or maybe you are a local pub in Lavenham, or Halstead, and want to put on special regular events. Whatever you require we can help – we will help with menu plans, calculating costs and machine hire or whole event catering. Just contact the CS department to get started. If you are thinking of utilising us then we will help with training and you can make full use of our expertise so don’t worry that the machines look like a technophobes nightmare – once you get started they really are pretty easy to use. After a hectic weekend it’s always nice to finish up on the Saturday or Sunday – clean everything down and pack away and then you have a couple of quieter days before building up to the weekend again. I haven’t even looked at the worksheets for next week but I know we have some really big events coming up and then it’s the Halloween and Bonfire night celebrations. If you haven’t already got something planned give us a call and we can set something up with Taste the Cracklin pig roast in Sudbury catering.